What is the best restaurant in Helsinki? This morning I realized that the answer depends highly on: which list you are looking at. Helsingin Uutiset just published a list of the best “New” Restaurants. Just for fun, I made an excel sheet with an extra two lists for Helsinki. So there is Helsingin Uutiset, where 1956 people voted for the best NEW restaurant in town. Eat.fi is the place where Finns give their votes. An additional challenge with eat.fi is that the choice of best restaurant depends on the map area you select on the screen. And then, of course, there is TripAdvisor, where “tourists” give their vote. 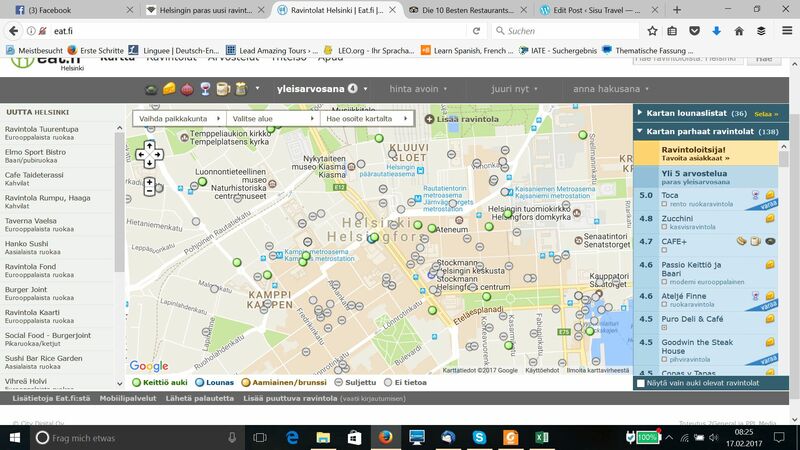 Have fun finding the best restaurant in Helsinki!